Big shells are to put little shells in "
Currently reading and re-reading A Hole Is to Dig by Ruth Krauss and Maurice Sendak. 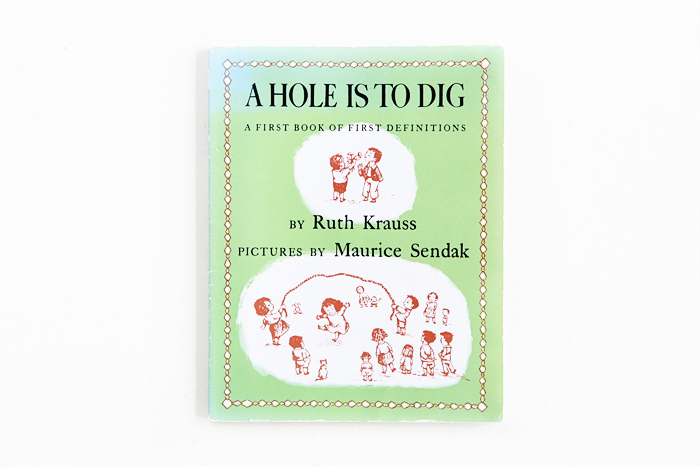 The understated charm of Sendak’s illustrations pair so well with Krauss’ endearing “first” definitions. I inherited this book maybe ten years ago, and I’m trying to remember from whom. I have a special feeling about this book, so I know it was passed on to me by someone thoughtful. How we acquire a book often becomes part of its story and its significance to us. Books seem to take on lives of their own and each one in our collection has its own story to tell beyond the narrative on its pages—be it the birthday or special milestone for which it was received as a gift, the particular season of childhood during which it was read with great frequency or the inspiration and wonder it instilled in us upon first turning its pages.